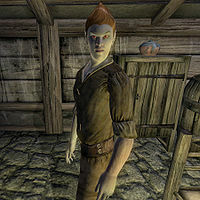 Diram Serethi is a Dunmer merchant and innkeeper of the Aleswell Inn in the village of Aleswell. Like the rest of the town's population, he fell victim to Ancotar's inconsiderate experiments down in Fort Caractacus, and apparently, he's the only one who is willing to do something about it. Diram doesn't have much of a life. He wanders around the Inn all day and night, together with his two hateful twin sisters and co-owners of the Inn, Adosi Serethi and Urnsi Serethi. Like the other residents of Aleswell, Diram has a constant Chameleon ability that causes his supposed invisibility. His attire consists of a pair of belted braies, a collared shirt and a pair of sandals. He only carries a small amount of gold. When you arrive in Aleswell for the first time, he will actively seek you out himself, should you fail to visit him at the Inn: "Excuse me. We have a small problem that we hope you can help us with. You may be wondering why you can't see me. We are all wondering the same thing. Everyone in Aleswell suddenly became invisible several weeks ago. It was sort of fun at first, but the novelty has definitely worn off now. You can imagine how difficult it is to run an inn while invisible. Once you get a reputation as a haunted inn, you can just forget about it. So we've all been keeping quiet, hoping the spell will wear off. But we're running out of patience. We're sure it was Ancotar's doing, but we can't find him. If you can help us, we will be extremely grateful." He will then elaborate: "He's a wizard who took up residence in the ruins of Fort Caractacus a couple of years ago. He's caused us no end of trouble with his magical experiments, but nothing as bad as this. We've tried to find him, but had no luck. If he's still living in the fort, he's hiding from us, and no wonder. If you could find him and get him to remove this cursed invisibility, we will all be in your debt." On Ancotar he will say: "We're pretty sure he's still hiding out in Fort Caractacus, although he never answers when we've tried to find him." When asked about Fort Caractacus, he will warn you: "It's just to the southeast of here. Follow the path down the hill. But watch out for the invisible monsters that infest the ruins!" If you speak with him during the quest, he will impatiently ask: "Have you talked to Ancotar yet? Can he make us visible again?" If you approach him after receiving a scroll from Ancotar he will say: "Ancotar gave you a scroll to get rid of the invisibility? Fantastic! What are you waiting for?" Upon successful completion of the quest, he will be the first to thank you in person: "Thank you, thank you! I can't tell you how good it feels to be able to see myself again. My sisters, on the other hand ... I wouldn't mind if they had stayed invisible! Ha ha ha! Ah, me... Friend, you are welcome at the Aleswell Inn anytime. Free of charge." From that point, you can sleep for free at the Inn: "There's never any charge for you, friend. Upstairs, first door on the left." If you return to Aleswell later he will definitely remember who you are: "Ah, the savior of Aleswell! Whatever you need, I'm at your service." If you ask him about Ancotar he will respond: "We haven't seen him since that whole invisibility mess. I hope it stays that way!" If you fail the quest, Diram will be really angry and practically ask you to leave town forever: "What? Ancotar gave you TWO scrolls and you wasted them both?! We trusted you to help, and you betrayed us! It would be best if you left this town and never came back." Approach him again and he will repeat: "I told you not to come back here, and I meant it." Diram's class is Merchant, and therefore in the Construction Set merchant services are enabled (with 200 gold to barter). However, he will never barter with you and it is not possible to invest in his store. Therefore, he does not actually provide any merchant services during the game.